Recent mapping adventures have reminded me just how much I enjoy studying the St. Peter Sandstone. This sandstone was named by Arkansas’ first State Geologist, David Dale Owen, for exposures on the St. Peter River, now called the Minnesota River, in southern Minnesota. 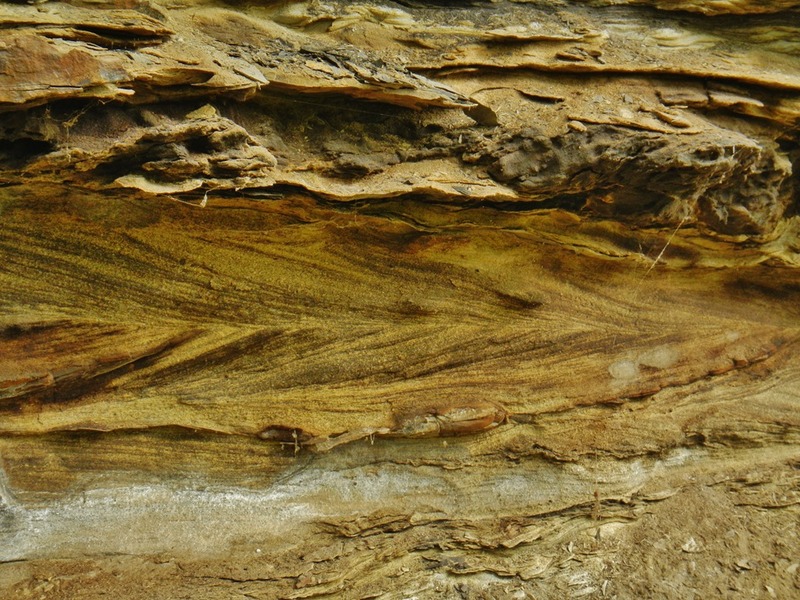 The sandstone is Middle Ordovician in age (around 460 million years old) and during that time it extended all the way from Minnesota into Texas. It is easy to recognize the St. Peter Sandstone whether you are in Minnesota or Arkansas – clean, sugary, white sandstone. In fact, here is a photo taken from the place where it was first described, known as the type section, under a bridge near Fort Snelling, in St. Paul, Minnesota. St. Peter Sandstone in its type area. In Minnesota the sandstone easily falls apart. 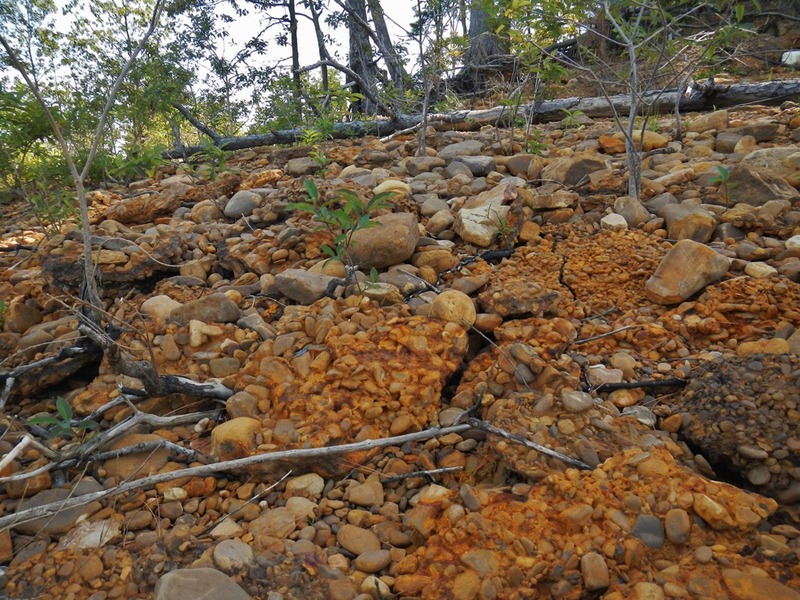 In Arkansas, the surface of the outcrop is case- hardened meaning there is a hard rind on the rock that forms due to iron-rich water percolating through it and depositing iron on the surface as the water evaporates. Where this rind is broken, the sand grains fall apart more easily, as at the type area. 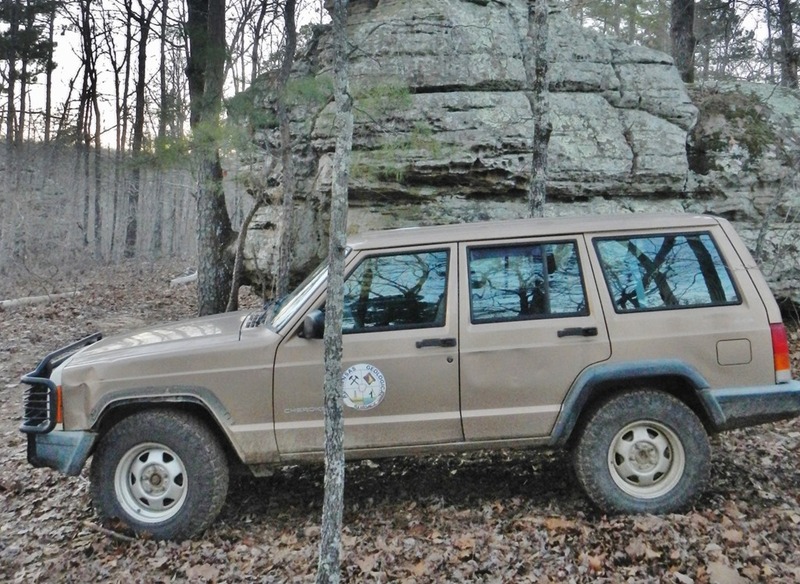 The St. Peter Sandstone cropping out in the parking area for the spring at Blanchard Springs Recreation Area. 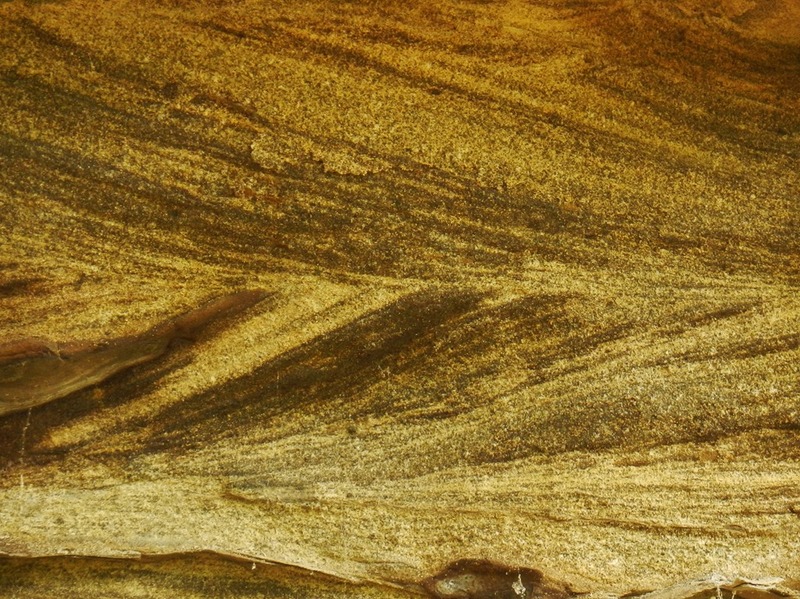 The contact of the St. Peter Sandstone with the underlying Everton Formation is particularly interesting. It is unconformable which means there was a period of non-deposition and erosion before the St. Peter was deposited. It is also undulatory with as much as 20 feet of relief in Arkansas. The relief is the difference between the top and bottom of an undulation. Flint, 1956, reports that these undulations can reach up to 200 feet in Wisconsin. Pretty amazing! In the photo above, the relief at the contact is probably around 5-6 feet. Note the rock hammer for scale. The rock above the hammer is the St. Peter Sandstone while the rock the hammer is resting on is the Everton Formation. Also notice the curvature of the contact. The reason for the unconformable undulating contact is that the sand in the St. Peter was deposited upon the karsted Everton surface. Karst forms when rock such as limestone is exposed to slightly acidic rainwater or groundwater and develops sinkholes, caves, and enlarged fractures. Since this karst surface has been buried by the St. Peter Sandstone, it is considered paleokarst. The geologic story goes something like this. After the sea that deposited the Everton Formation retreated, the limestone at the top of the formation was exposed. Weathering and erosion lasted for up to tens of millions of years, during which time an extensive karst surface developed (Palmer and Palmer, 2011). Sand was brought into the area from the source area to the north (Great Lakes region) by rivers and wind. Later, as the sea advanced again, it spread the sand over the area filling in the depressions and forming a thick deposit covering a large portion of the mid-continent. In this photo the relief is approximately 18 feet. Note the 6-foot-tall geologist for scale. The red line indicates the contact between the St. Peter above and the Everton below. The St. Peter Sandstone is relatively resistant to erosion compared to the surrounding rocks; therefore, it is usually a bluff-former. The tallest bluff I have seen crops out at Blanchard Springs Recreation Area near the group camp and the amphitheater. 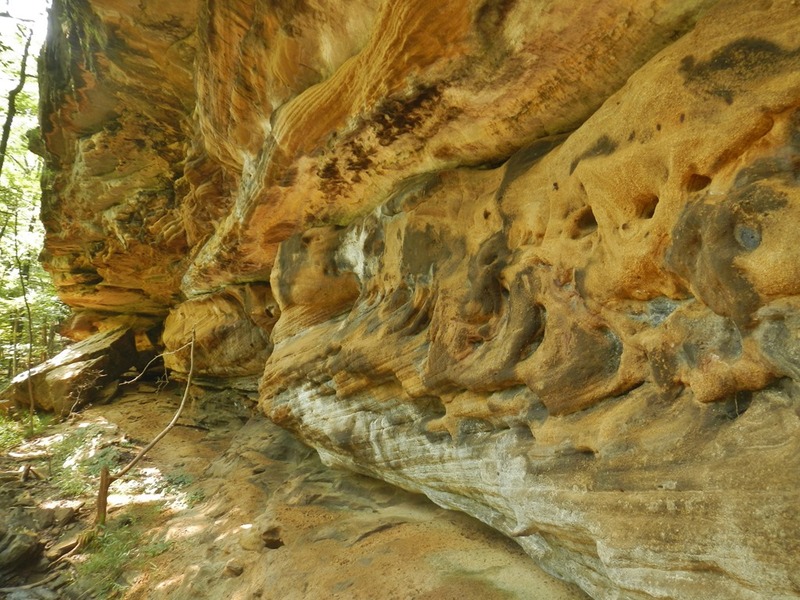 Enjoy these photos of the St. Peter Sandstone and hope to see you in the field! Tall (approximately 70 feet tall) St. Peter bluff behind the amphitheater at Blanchard Springs Recreation Area. St. Peter Sandstone bluff near Blanchard Springs Recreation Area. 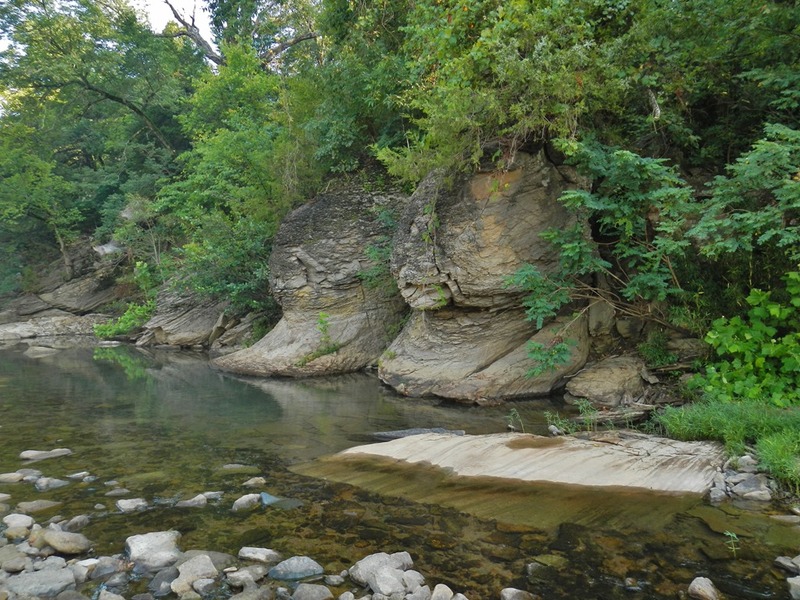 The St. Peter Sandstone dipping to creek level at the swimming area in Blanchard Springs Campground. Flint, A.E., 1956, Stratigraphic relations of the Shakopee Dolomite and the St. Peter Sandstone in southwestern Wisconsin: Journal of Geology, vol. 64, no. 4, pp. 396-421. Giles, A.W., 1930, St. Peter and older Ordovician sandstones of northern Arkansas: Arkansas Geological Survey Bulletin 4, 187 p.
Palmer, A.N. and Palmer, M.V., 2011, Paleokarst of the USA: A brief review; in U.S. Geological Survey Karst Interest Group Proceedings, Fayetteville, Arkansas: U.S. Geological Survey Scientific Investigations Report 2011-5031, pp. 7-16. 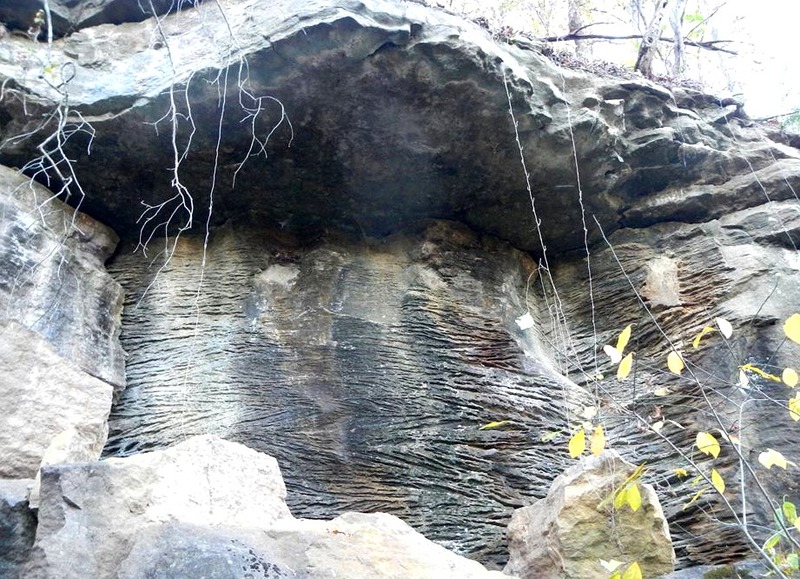 This entry was posted in Notes From The Field and tagged Paleokarst, sandstone, St. Peter Sandstone, Unconformity on January 25, 2019 by argeology. 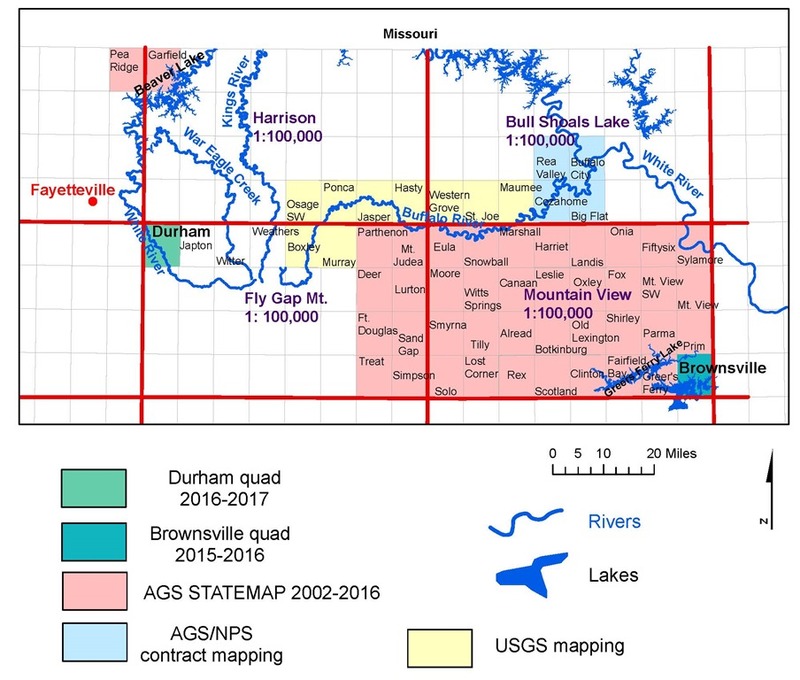 Geologic mapping of the Japton and Witter 7.5-minute quadrangles was recently completed by the Arkansas Geological Survey’s STATEMAP field team. In Arkansas, the STATEMAP Program is currently focused on detailed 1:24,000-scale mapping in the Ozark Plateaus Region, located in the northern part of the state. The new map is useful to landowners interested in developing their land for personal or commercial purposes, to scientists seeking a better understanding of landscape evolution and geologic history, and to planners responsible for resource development and mitigating environmental impacts. Angela Chandler, Principal Investigator for the project, wrote the grant for fiscal year 2018 and we received funding adequate to produce two maps. 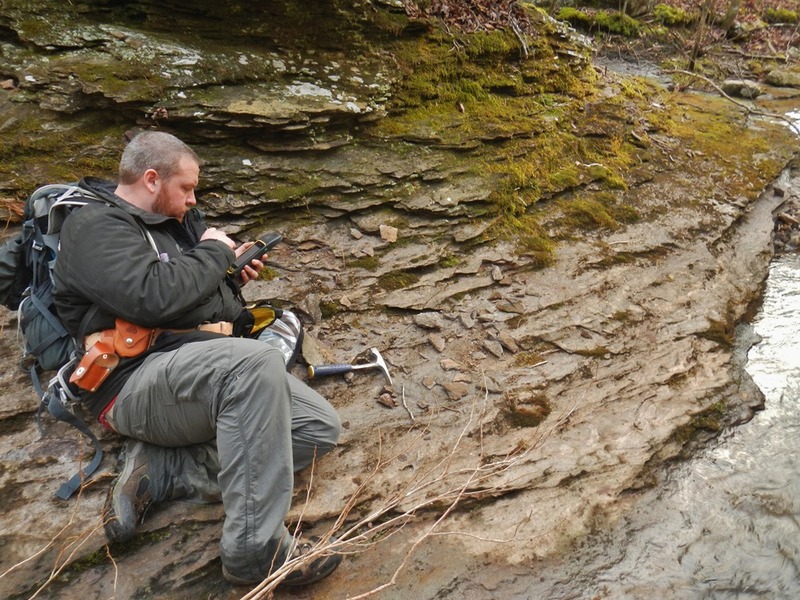 Two geologists, Richard Hutto and Garrett Hatzell, began their field season last July and after putting in 76 days in the field, concluded that portion of their work in February of this year. 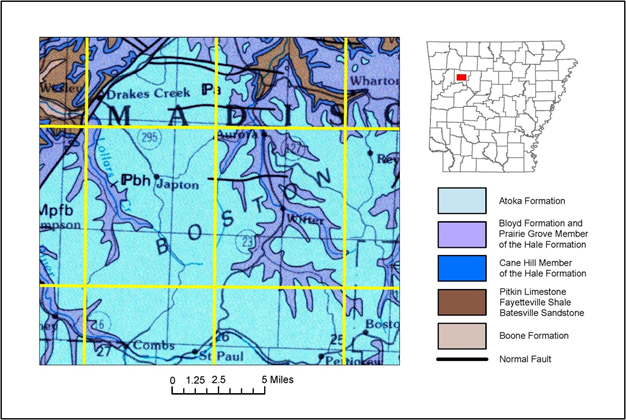 The area of investigation lies within the Interior Highlands Physiographic Region in north Arkansas, specifically the Boston Mountains Plateau portion of the Ozark Plateaus Province. Previous work by the AGS in this area had been done in preparation for the 1:500,000-scale Geologic Map of Arkansas by Haley et al. circa 1976 (see Fig. 1). That mapping project delineated five stratigraphic units in this area, but through extensive field reconnaissance, we were able to define ten units on these maps at the 1:24,000 scale. Further division is possible, but several units were considered too thin to depict on the 40-foot contours of the topographic map currently available, or too difficult to delineate by lithology alone. Several tributaries of the White River are located on these quadrangles including Lollars Creek, Drakes Creek, and War Eagle Creek. 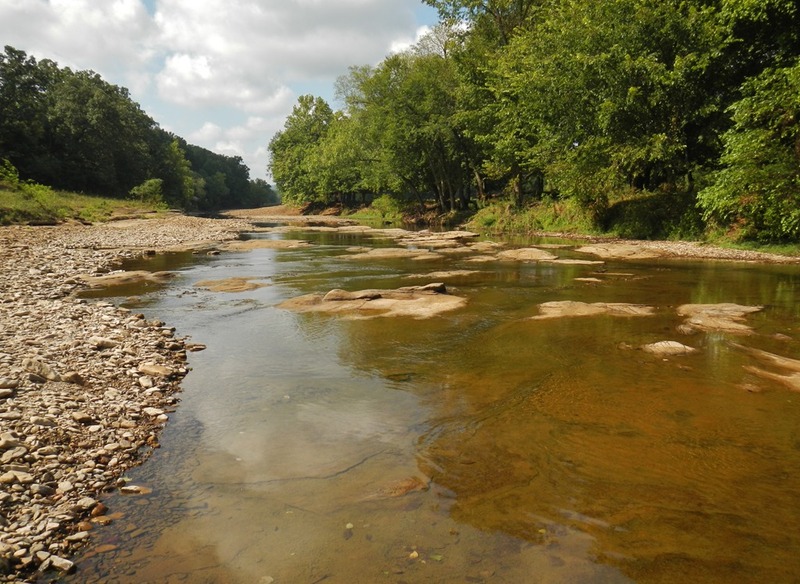 The White River is a major water resource in Arkansas and southern Missouri, and as such we need to learn as much as we can about this important watershed. Included in the field work was hiking, wading, or swimming the entire 13-mile stretch of War Eagle Creek located within the Witter quadrangle, the 10 miles of Lollars Creek within the Japton, and many smaller drainages. 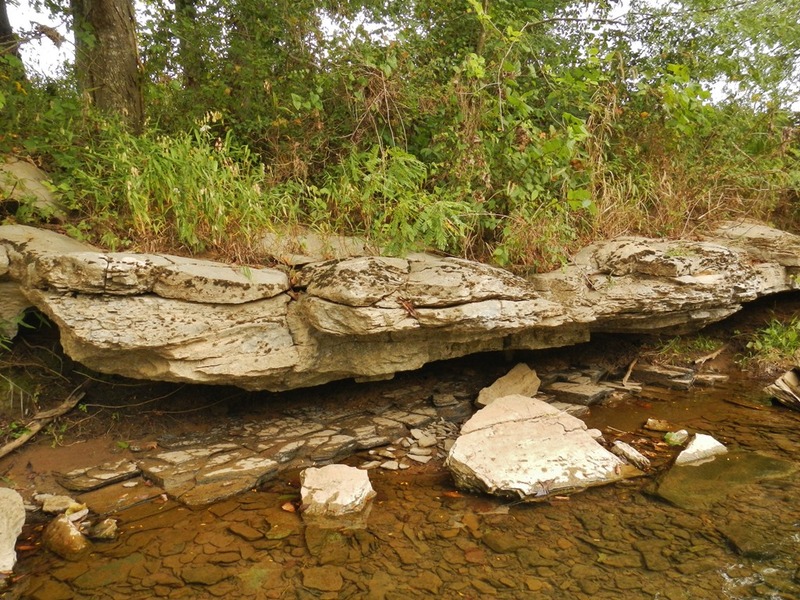 The reason we concentrate our efforts on stream beds is that there, erosion has typically removed soil and loose rock leaving well-exposed outcrops of bedrock for us to study. Also, being able to see the entire stack of the rock sequence as we move up or downstream helps put each formation in context with the others. Discovering where one formation contacts another is one of the most important things we do while mapping. Because formations are laterally extensive, similar contacts can be connected into a contact line separating one formation from another. Figuring out where to draw these lines on the map is a major goal of the project. From mid-February through the end of June, we analyzed field data, classified rock specimens, drew formation contacts and structures on the map, then handed it off to our cartography staff to digitize. Final layout and production of the maps was accomplished by the geologists, after which they were subjected to an extensive review and editing process by fellow staff. Alluvium in War Eagle Creek (left). 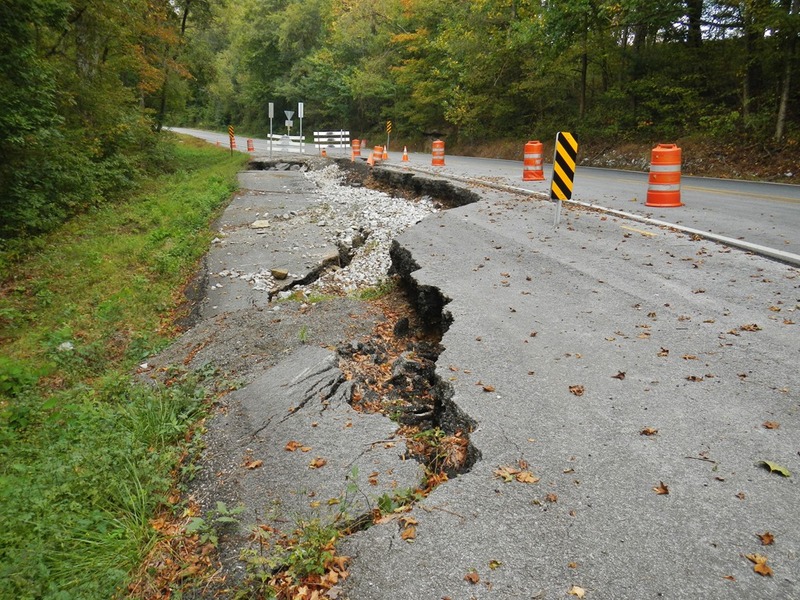 Landslide on Highway 23 above Dry Fork (right). 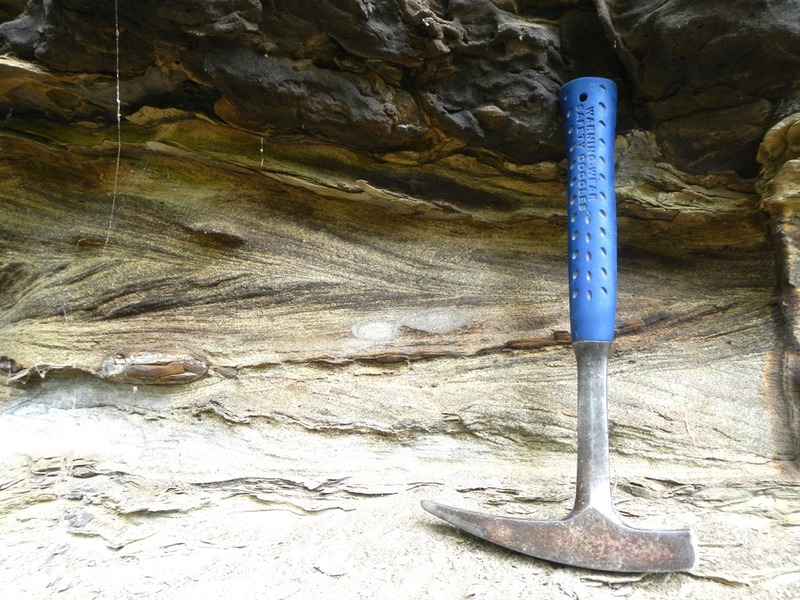 Ball and pillow structures in the Atoka Formation in Drakes Creek. Sequence of photos zooming into herringbone cross-beds in the Greenland Member of the Atoka Formation. 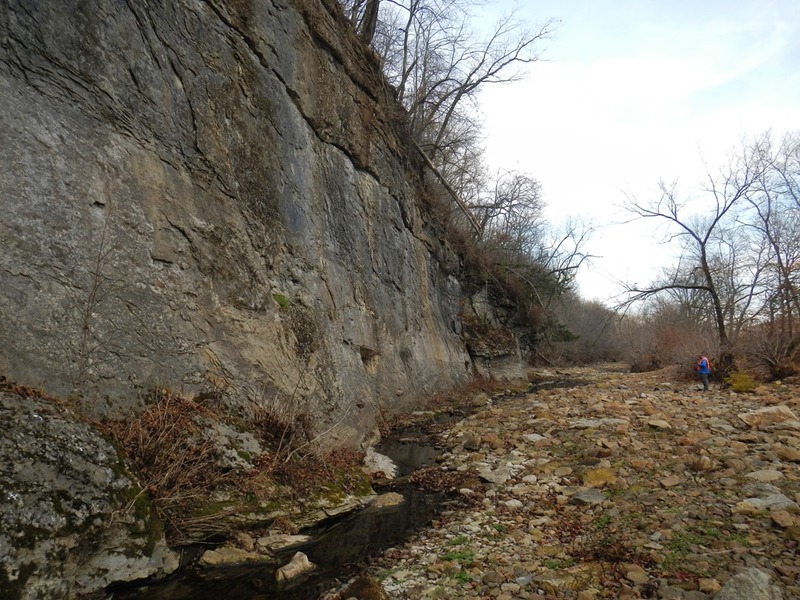 Large blocks of Kessler Limestone sliding into Lollar’s Creek. Sequence of photos zooming into oncolitic limestone of the Kessler Member of the Bloyd Formation. The oncolite pictured far right is nucleated on a tabulate coral. 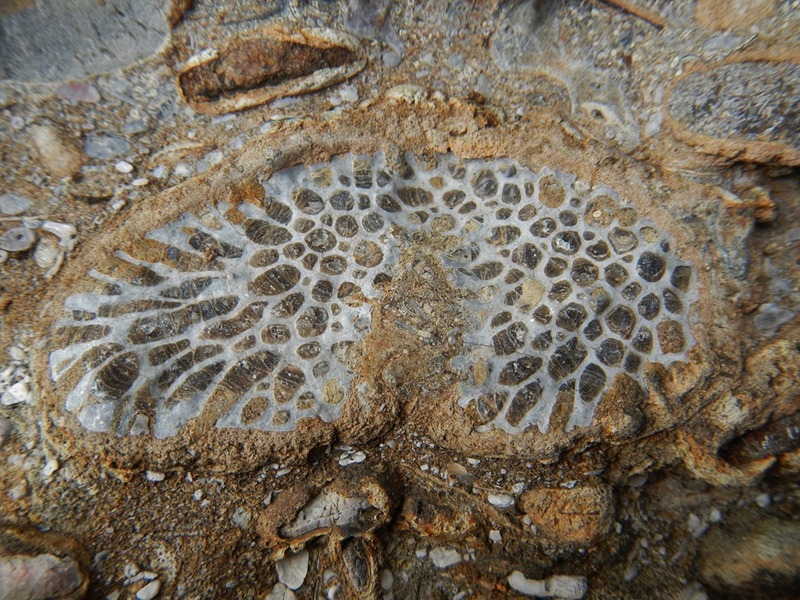 Lycopod (tree-like plant) fossil weathering out of the Dye Shale. 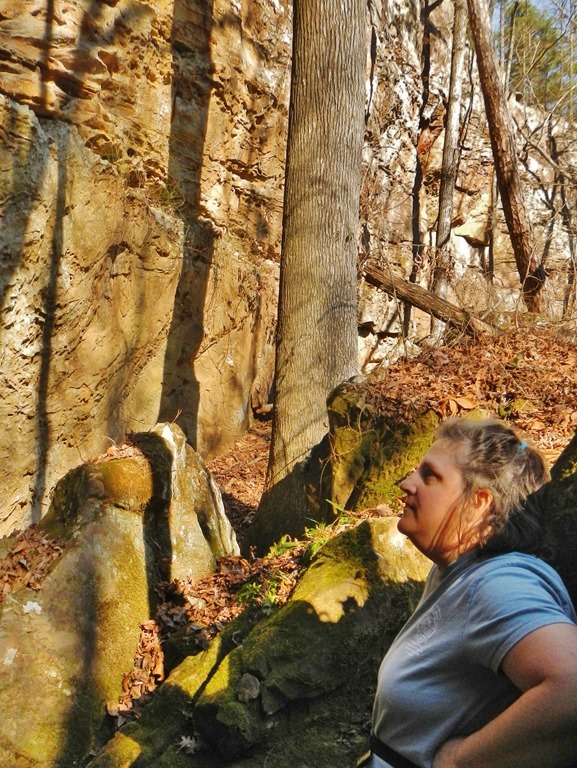 Top of the Parthenon sandstone (Bloyd Formation) in Lollar’s Creek (left). Parthenon resting on the Brentwood Limestone (Bloyd Formation) with travertine precipitating at the drip line (right). Siltstone unit in the upper Brentwood Limestone. 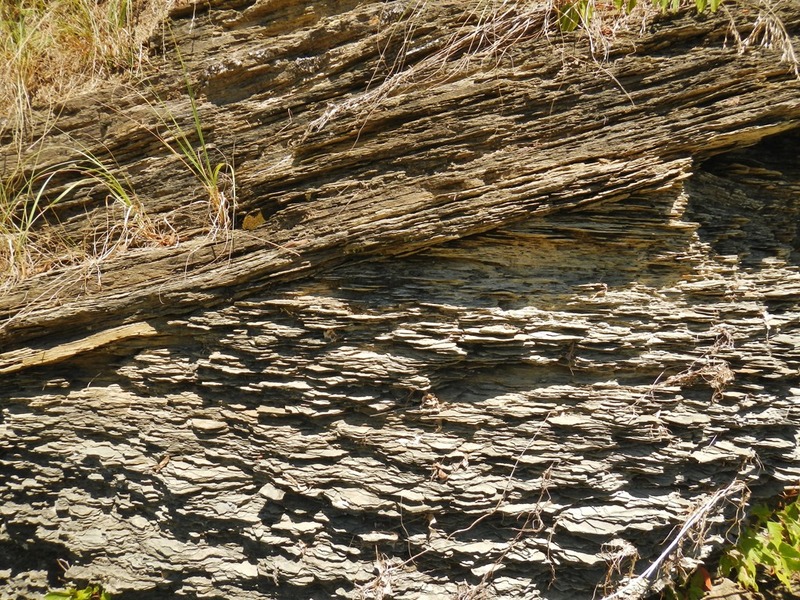 Cross-bedded (left) and bioturbated (right). Biohermal mounds in the Brentwood Limestone in Jackson Creek. 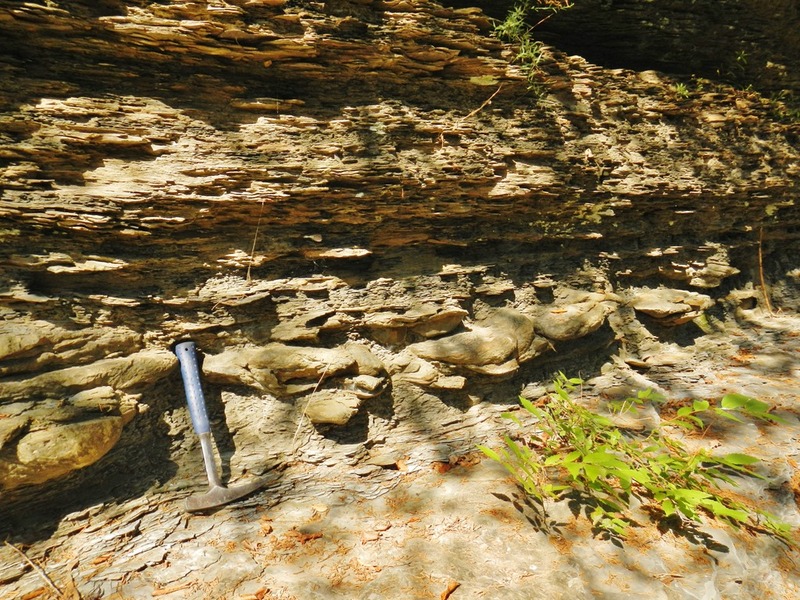 Massive bluff of limey sandstone in the Prairie Grove Member of the Hale Formation. Sandy limestone in the Prairie Grove. 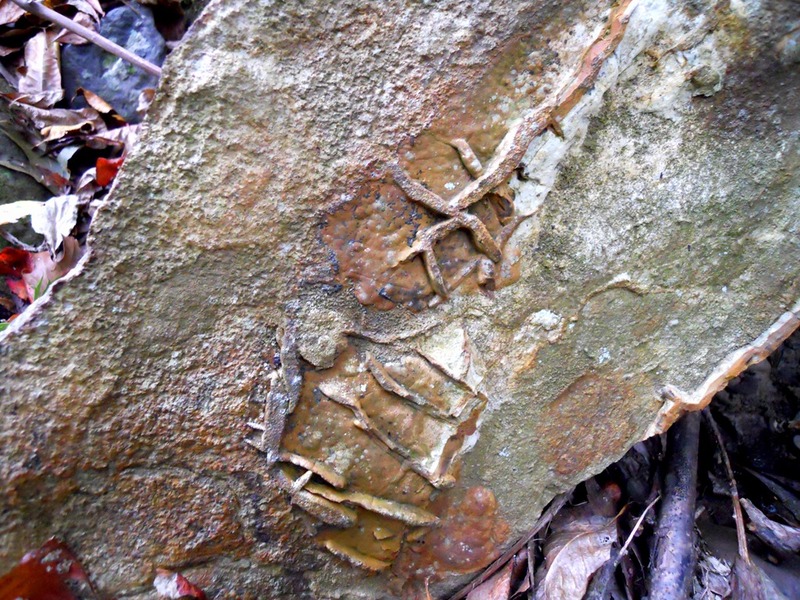 Stream abrasion has revealed cross-bedding (left) and an ammonoid (right). 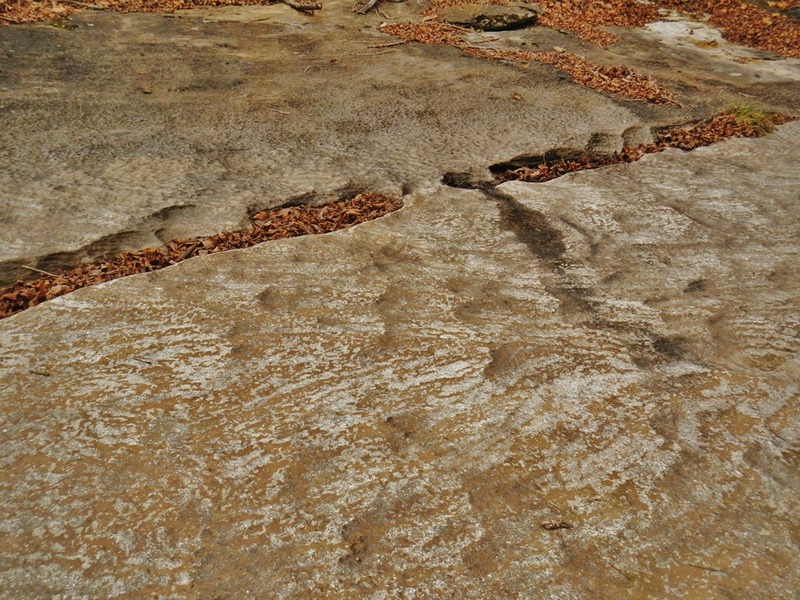 Typical thin-, ripple-bedded sandstone of the Cane Hill Member of the Hale Formation (left). 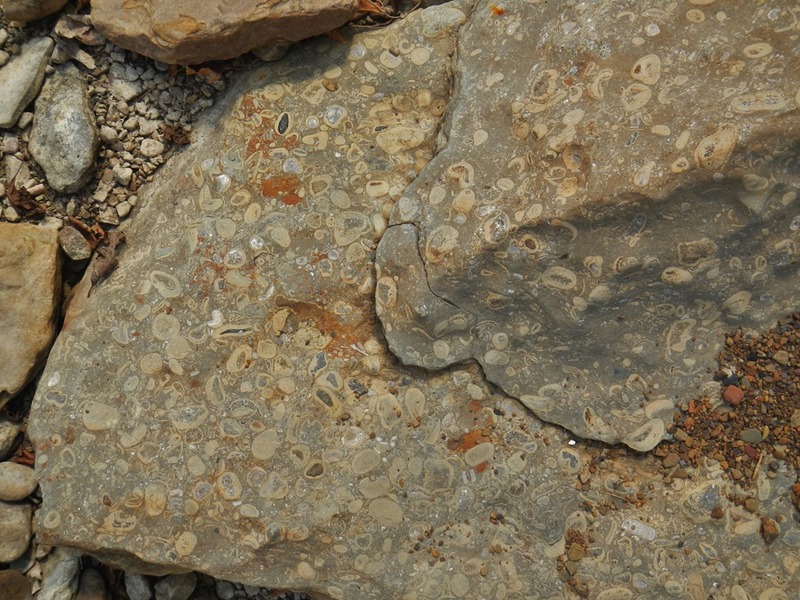 A basal conglomerate in the Cane Hill contains fossiliferous and oolitic limestone pebbles and fossil fragments (right). This unit probably rests on the Mississippian-Pennsylvanian unconformity. 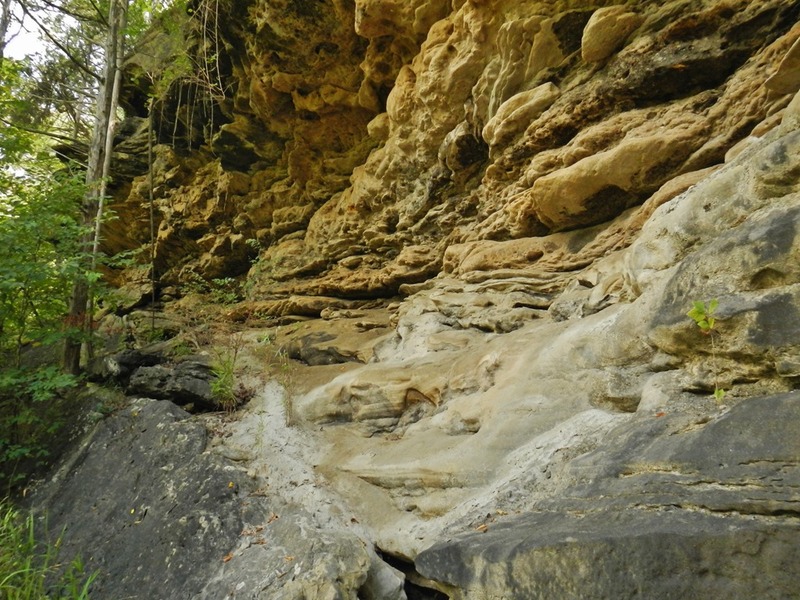 The Pitkin Limestone in War Eagle Creek. This year we will be mapping the Weathers quadrangle which is just east of the Witter, and the Delaney quadrangle which is just south of the Durham (which we mapped two years ago). The Kings River flows through Weathers, so this should be a good place to start while river levels are low (and it’s so hot!). I will update you as I can, but until then, I’ll see you in the field! This entry was posted in Maps, New Publications, Notes From The Field and tagged Alluvium, Arkansas, Atoka Formation, Bloyd, Brentwood Limestone, Cane Hill, Carboniferous, Dye Shale, Geologic Mapping, Geology, Hale Formation, Japton Quadrangle, Kessler Limestone, landslide, limestone, Mississippian, Ozark Mountains, Ozark Plateaus, Parthenon Sandstone, Pennsylvanian, Pitkin Limestone, Prairie Grove, sandstone, shale, STATEMAP, Trace Creek Shale, Witter Quadrangle on July 9, 2018 by argeology. 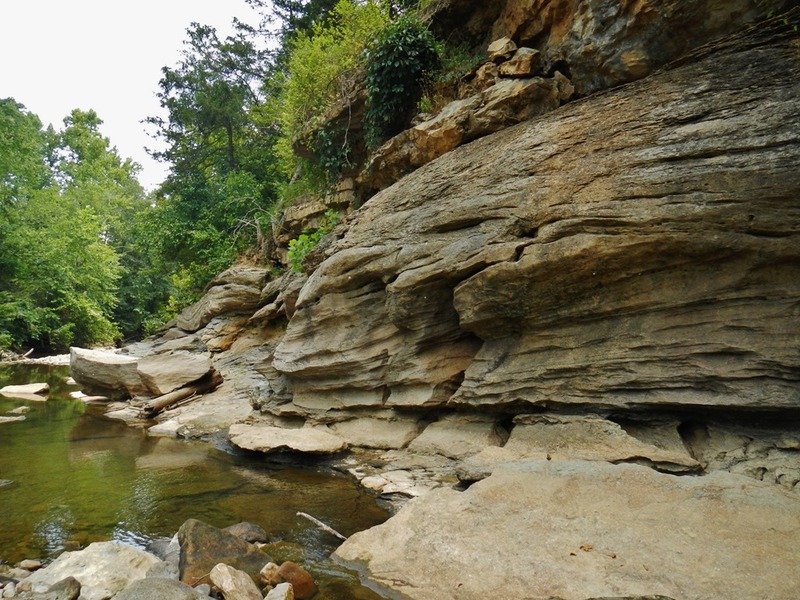 If you have spent any time on Beaver Lake in northwestern Arkansas, then you have probably seen sandstone paleokarst features. Some stand tall like towers while others appear to be irregular to rounded masses. It is common to see only the tops of these features when the lake level is low to normal. Top of sandstone mass in Beaver Lake. Photo taken in October, 2016. Sandstone mass along Beaver Lake. Photo taken in October, 2016. These features have been in geology literature since 1858 when David Dale Owen made his first geological reconnaissance of the northern counties. He described a mass of isolated sandstone within adjacent magnesian limestone (now called dolostone) which stands out forming a conspicuous feature in the landscape. Purdue, 1907, called them cave-sandstone deposits and was the first to consider them paleokarst. Purdue and Miser, 1916, noted many of these deposits and concluded several were ancient sinkholes that had been filled with sand. 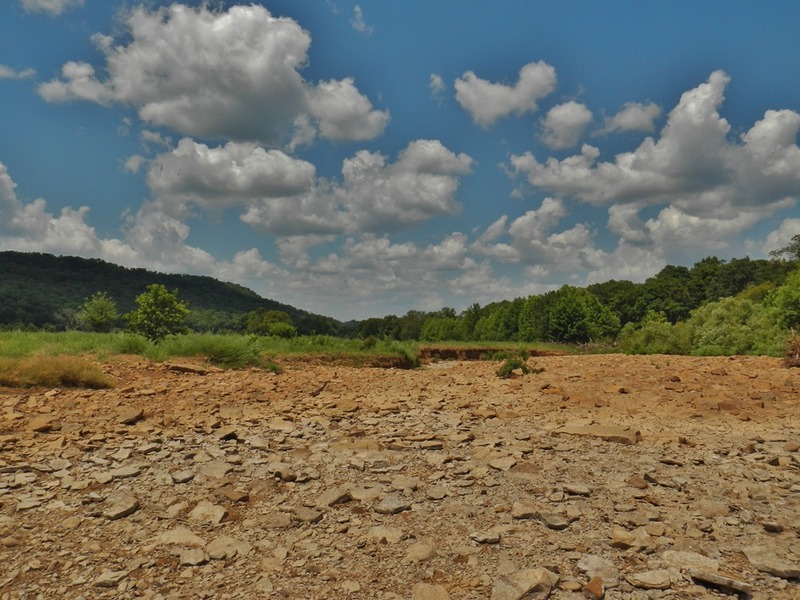 Two theses that pre-date the construction of Beaver Lake (Arrington, 1962, and Staley, 1962) mention numerous sandstone bodies within the Powell. 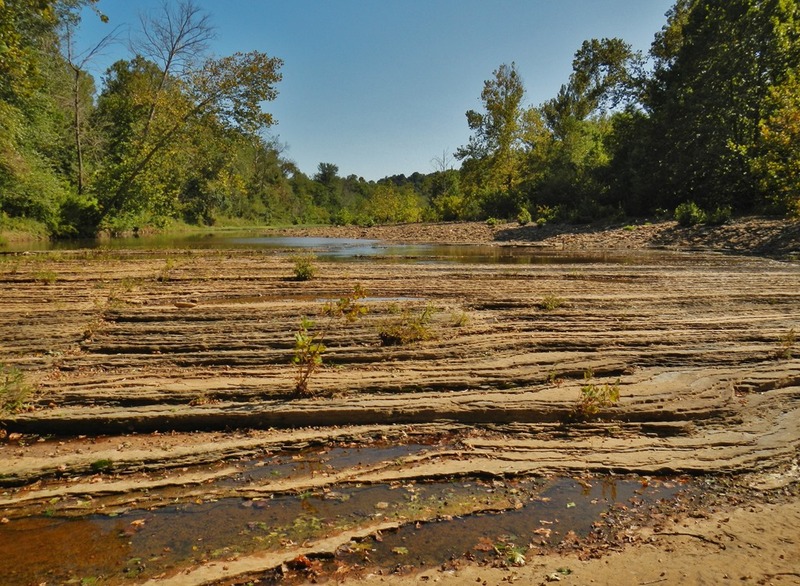 One very large sandstone mass was seen in the White River (Arrington, 1962). It is approximately 45 feet tall! Unfortunately, it is now covered with water. Sandstone mass in the White River near Hwy 12 access to Beaver Lake. From Arrington, 1962. So how did these features form? First, let’s define paleokarst. Paleokarst consists of karst features that formed in the geologic past and were preserved in the rock record. Karst features include sinkholes, springs, and caves. These features form when acidic rain and ground water dissolves carbonate rocks (mainly rocks that contain calcium carbonate – calcite, or calcium-magnesium carbonate – dolomite). 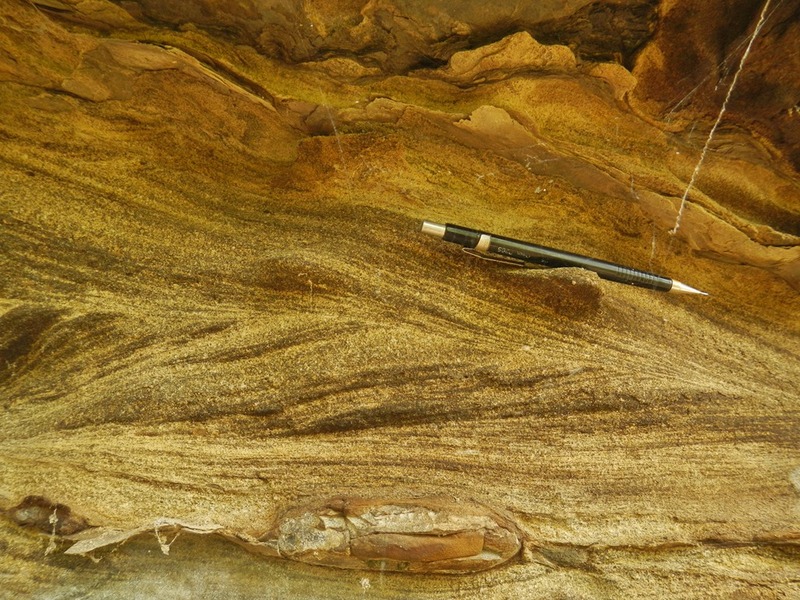 The majority of sandstone masses are surrounded by dolostone, composed of dolomite, in the Powell Formation. The Powell is Lower Ordovician in age, meaning it formed around 470 million years ago (mya). 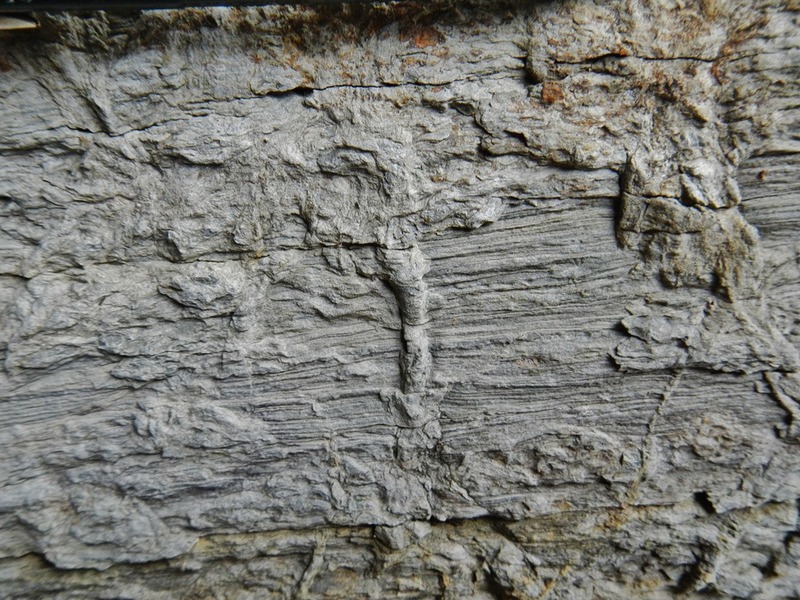 It is likely that this formation was exposed to weathering at that time. Depressions of various size, called sinkholes, developed on the exposed land surface. Later, sand filled the depressions and eventually became rock called sandstone. The age of the sandstone masses ranges from Middle Ordovician (approx. 450 mya) to Middle Devonian (approx. 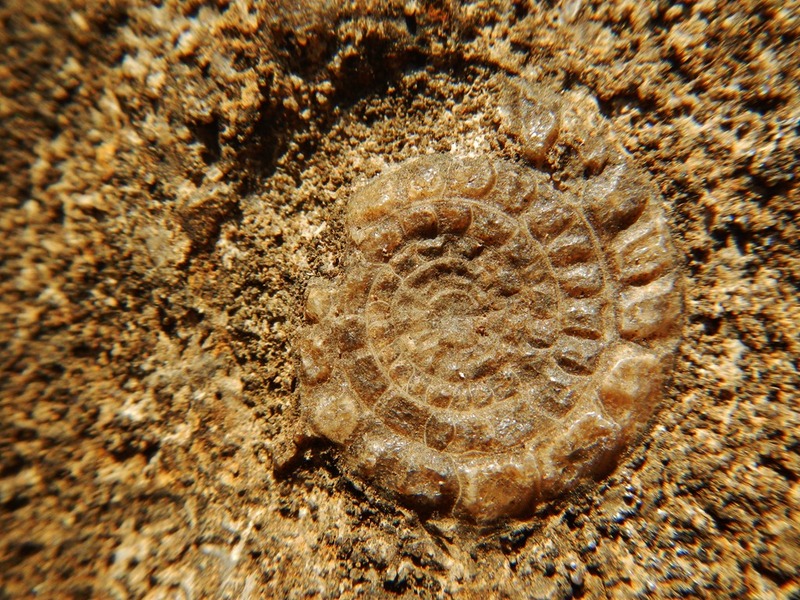 390 mya). Therefore, there is a gap in the rock sequence, between dolostone in the Powell and the sandstone, called an unconformity, lasting from 20-80 million years. Sandstone mass (center) surrounded by Powell dolostone along Beaver Lake. Photo taken in September, 2016. 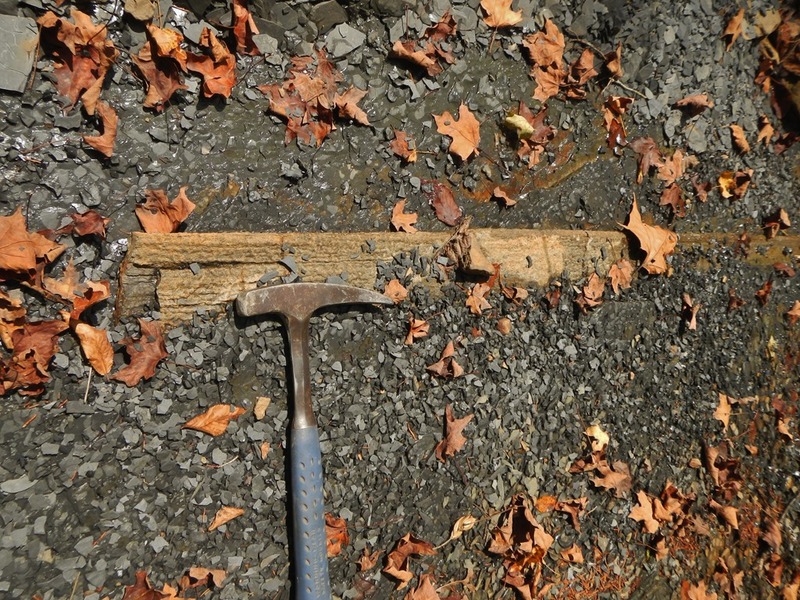 Why is paleokarst important, other than being interesting features to observe? Paleokarst provides clues to former geologic conditions and changes in climate and sea level (Palmer and Palmer, 2011). 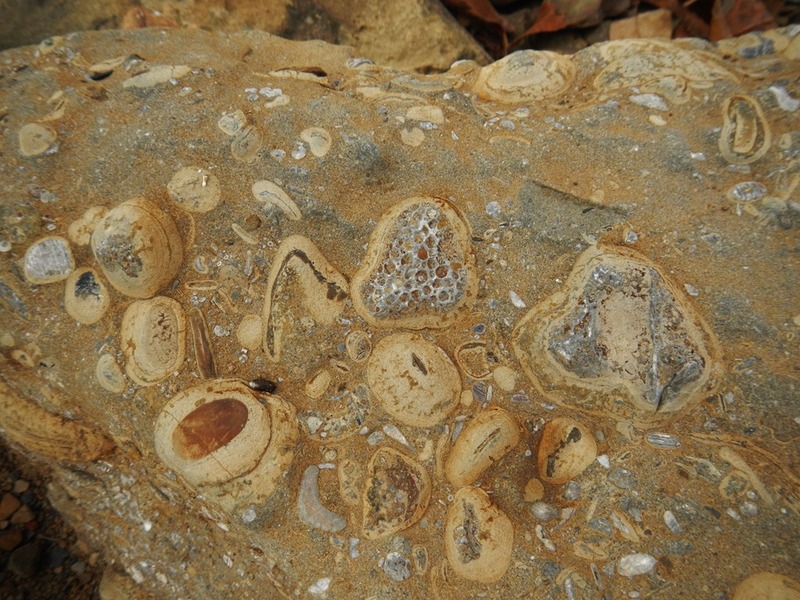 We know that sea level was high in the Lower Ordovician and shallow seas covered all of northern Arkansas. But, in the Middle Ordovician, sea level lowered and the sandstone paleokarst features provide additional evidence supporting this change. 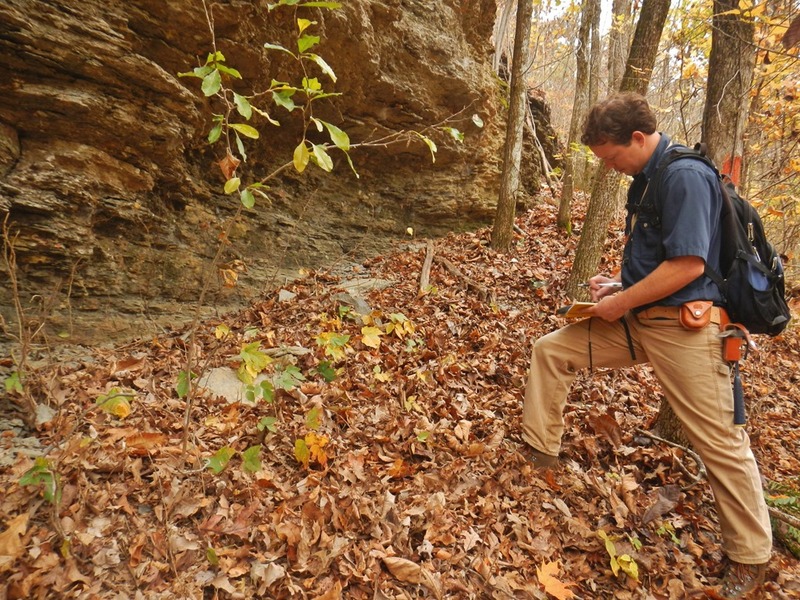 Many sandstone paleokarst features were located while mapping the War Eagle quadrangle. Fifty-two sandstone masses were located around Beaver Lake. This is not a complete list, however, since the main focus of mapping was not a paleokarst inventory. Sandstone masses (yellow) located from recent geologic mapping around Beaver Lake. The War Eagle quadrangle was mapped in preparation for State Park Series 4 – Geology of Hobbs State Park. 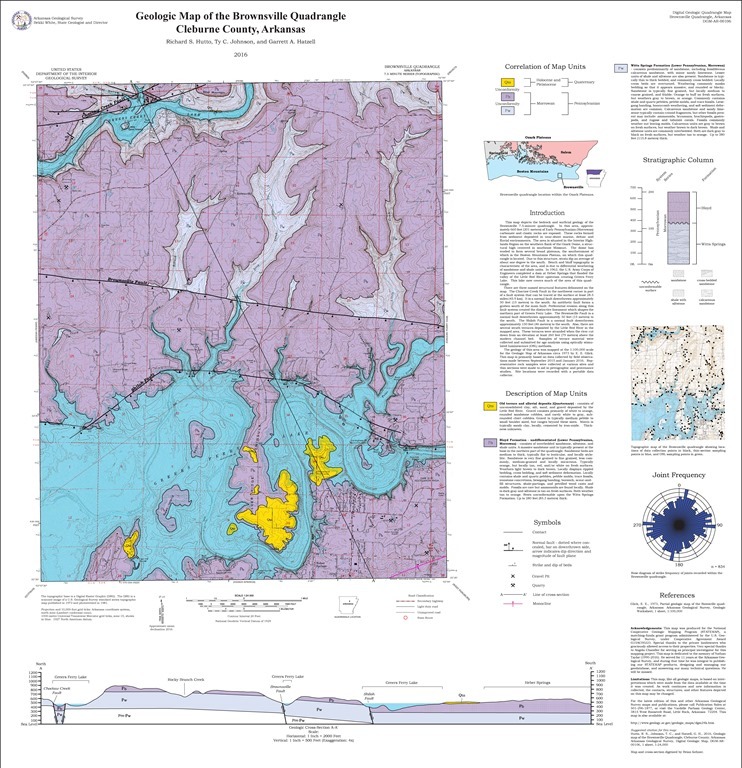 Follow the link below to see the geologic map of the War Eagle quadrangle: http://www.geology.ar.gov/maps_pdf/geologic/24k_maps/War%20Eagle.pdf. Arrington, J., 1962, The geology of the Rogers quadrangle: University of Arkansas M.S. Thesis, 61 p.
Palmer, A.N., and Palmer, M.V., 2011, Paleokarst of the USA: A brief review: in U.S. Geological Survey Karst Interest Group Proceedings, Fayetteville, Arkansas: U.S. Geological Survey Scientific Investigations Report 2011-5031, p. 7-16. Owen, D.D, 1858, First report of a geological reconnaissance of the northern counties of Arkansas made during the years 1857 and 1858: Little Rock, 256 p.
Purdue, A.H., 1907, Cave-sandstone deposits of the southern Ozarks: Geological Society of America Bulletin, vol. 17, pp. 251-256. Purdue, A.H., and Miser, H.D., 1916, Geologic Atlas of the United States, Eureka Spring-Harrison Folio, Arkansas-Missouri: U.S. Geological Survey Folio No. 202, 82 p.
Staley, G.G., 1962, The geology of the War Eagle quadrangle, Benton County, Arkansas: University of Arkansas M.T. 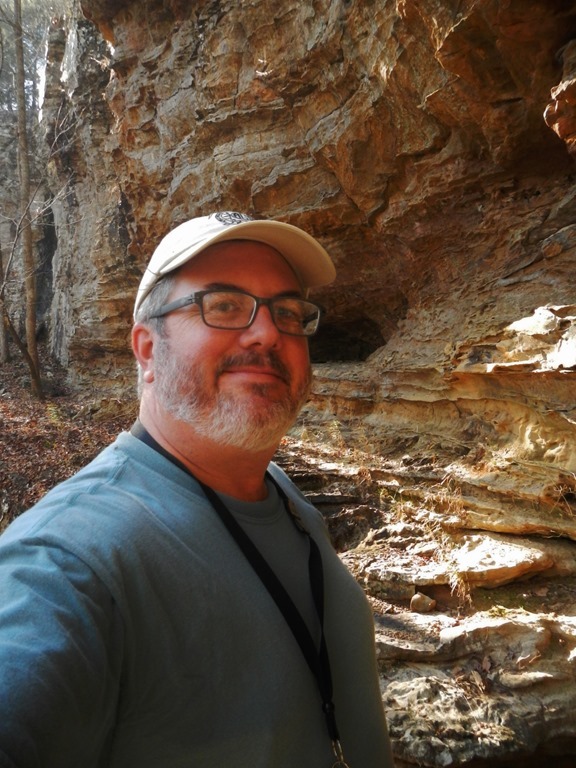 Thesis, 56 p.
This entry was posted in Notes From The Field and tagged Beaver Lake, cave sandstone deposits, Clifty, Devonian, dolostone, Hobbs State Park, karst, Ordovician, Paleokarst, Powell, sandstone, War Eagle on September 12, 2017 by argeology. I was working near Lake Fort Smith State Park this last week when I came across a peculiar mineral deposit resembling Frankenstein’s Scars (Fig. 2). It was just in time for Halloween! The resemblance is uncanny. Despite the horror, there is a lot of geology illustrated in this rock. The mineral that forms the “scars” seen in the photo is called limonite, and it was deposited within a cavity in a stylolite. A stylolite is a surface, typically a bedding plane, that has recrystallized due to pressure from the weight of overlying rock material. Stylolites can be recognized by their rough, jagged appearance (it’s difficult to see in this photo, but trust me – it’s there). 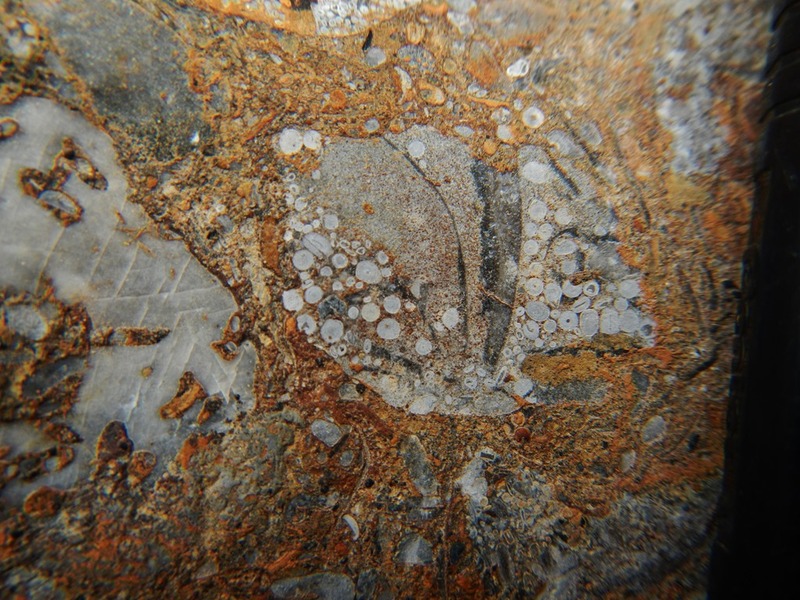 The limonite “scars” formed in a pattern called boxwork and, surrounding the boxwork, limonite is also present in botryoidal form: a crystal shape resembling small round globs (the orange goosebumps around the scars). 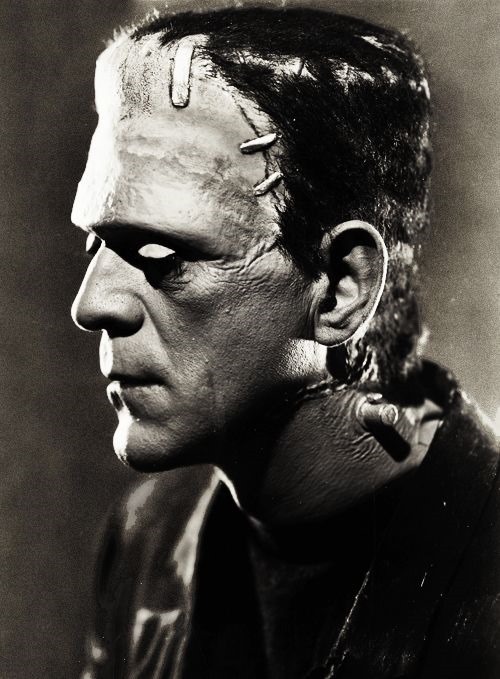 At this time, rocks are not thought to celebrate Halloween, although more work needs to be done to verify that. 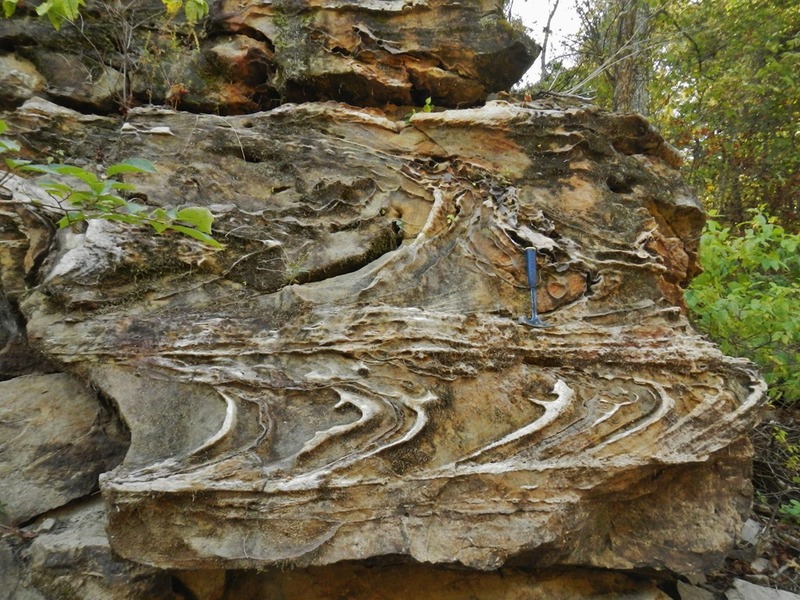 This entry was posted in #geoblog, GeoPic of the Week, Sedimentary Features and tagged Arkansas, Atoka Formation, Bytrioidal, frankenstein, Lake Fort Smith State Park, limonite, sandstone, stylolite, stylolitic on October 31, 2016 by argeology.